Celebrate Earth Day with Mass Hort! Lend a helping hand and welcome our flora and fauna for another season! Volunteers are needed for a variety of projects to get the gardens ready for the visitor season. Support our mission, preserve natural habitats and get involved on Earth Day! No experience needed! Volunteer together as a family or as a group - all are welcome! Teens too! Minors 14 and under must volunteer with a parent. If you want to volunteer as a group, please contact Amy Rodrigues at [email protected] to sign up. For-profit groups wishing to volunteer at our Earth Day event are requested to support the event with a $500 donation or the equivalent in-kind support in garden tools, trash bags, rakes, gloves and other garden supplies. Your support is greatly appreciated and will help make the day even more successful! Please contact Amy Rodrigues at [email protected] to sign up and for donation information prior to the event. Check out our opportunities below and join us! Email reminders, along with instructions and directions, will be provided prior to the event. All volunteers will be required to complete an Application and Release form. Wear closed-toe, sturdy shoes, comfortable clothes appropriate for the weather, and bring a hat, water and sunscreen. If you have them, please bring gardening gloves and trowel. Rain date is Sunday, April 28th. If you have any questions, please contact Amy Rodrigues, Volunteer Engagement Manager, at [email protected] or 617-933-4934. For current Mass Hort Garden Stewards, Bed Captains, and other lead volunteers only. 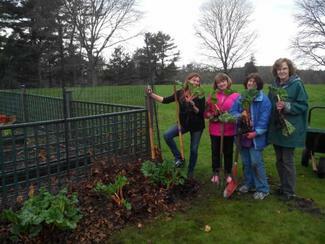 Serve as volunteer group leaders, work alongside volunteers in the gardens and on the grounds. Check in with staff in the Crockett Garden at 8 am.